“The Lessons of History” is high atop Patrick O’Shaughnessy’s best “per-page” books list. Among other things, Patrick is a prolific reader and his recommendations rarely (if ever) steer me wrong and so I immediately picked it up. 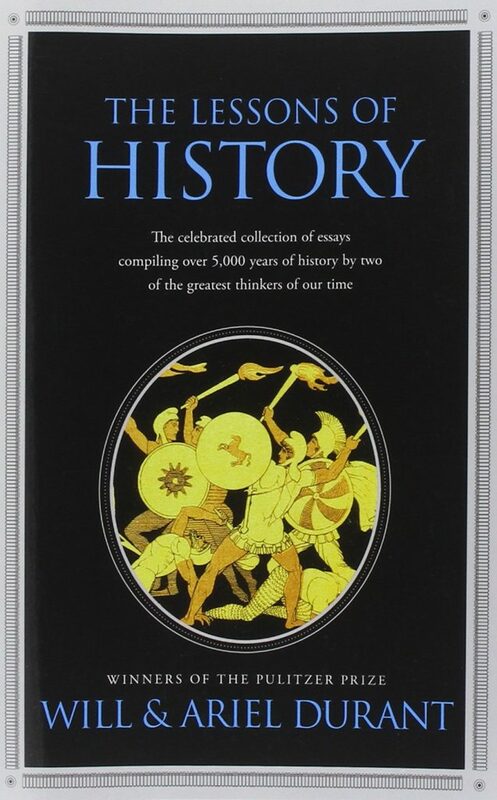 Pultizer Prize-winning historians Will and Ariel Durant spent their entire lives studying and writing about history. Together, they’ve published more than 50 books. “The Lessons of History” is a distillation of all of their works and lessons learned in one, short 102-page book. In reading this book, you’ll uncover some of history’s most powerful themes and quite possibly their impact on your life. Historiography cannot be a science. It can only be an industry, an art, and a philosophy — an industry by ferreting out the facts, an art by establishing a meaningful order in the chaos of materials, a philosophy by seeking perspective and enlightenment. The present is the past rolled up for action, and the past is the present unrolled for understanding. Perhaps, within these limits, we can learn enough from history to bear reality patiently, and to respect one another’s delusions. Generations of men establish a growing master over the earth, but they are destined to become fossils in its soil. The influence of geographic factors diminishes as technology grows. Man, not earth, makes civilization. History is a fragment of biology. The laws of biology are the fundamental lessons of history. The first biological lesson of history is that life is competition. Cooperation is real, and increases with social development, but mostly because its a tool and form of competition; we cooperate in our group — our family, community, club, church, party, “race,” or nation — in order to strengthen our group in its competition with other groups. War is a nation’s way of eating. It promotes cooperation because it is the ultimate form of competition. The second biological lesson of of history is that life is selection. In the struggle for existence some individuals are better equipped than others to meet the tests of survival. Inequality is not only natural and inborn, it grows with the complexity of civilization. Hereditary inequalities breed social and artificial inequalities; every invention or discovery is made or seized by the exceptional individual, and makes the strong stronger, the weak relatively weaker, than before. Freedom and equality are sworn and everlasting enemies, and when one prevails the other dies. Leave men free, and their natural inequalities will multiply almost geometrically, as in England and American in the nineteenth century under laissez-faire. To check growth inequality, liberty must be sacrificed, as in Russia after 1917. Utopias of equality are biologically doomed, and the best that the amiable philosopher can hope for is an approximate equality of legal justice and educational opportunity. A society in which all potential abilities are allowed to develop and function will have a survival advantage. The third biological lesson of history is that life must breed. Nature has no use for organisms, variations, or groups that cannot reproduced abundantly., She has a passion for quantity as prerequisite to the selection of quality. If the human brood is too numerous for the food supply, Nature has three agents for restoring the balance: famine, pestilence, and war. Medicine, sanitation, and charity nullify selection by keeping the unfit alive to multiple their like. Much of what we call intelligence is the result of individual education, opportunity, and experience; and there is no evidence that such intellectual acquirements are transmitted in the genes. In the United States the lower birth rate of the Anglo-Saxons has lessened their economic and political power. The birth rate, like war, may determine the fate of theologies. There is no humorist like history. History is color-blind, and can develop a civilization under almost any skin. Nor does human nature alter as between classes: by and large the poor have the same impulses as the rich, with only less opportunity or skill to implement them. Intellect is therefore a vital roce in history, but it can also be a dissolvent and destructive power. It is good that new ideas should be heard, for the sake of the few that can be used; but it is also good that new ideas should be compelled to go through the mill of objection, opposition, and contumely; this is the trial heat which innovations must survive before being allowed to enter the human race. If we divide economic history into three stages — hunting, agriculture, industry — we may expect that the moral code of one stage will be changed in the next. Man’s sins may be the relics of his rise rather than the stigmata of his fall. For fifteen hundred years this agricultural moral code of continence, early marriage, divorceless monogamy, and multiple maternity maintained itself in Christian Europe and its white colonies. It was a stern code, which produced some of the strongest characters in history. The authority of father and mother lost its economic base through the growing individualism of industry. To the unhappy, the suffering, the bereaved, the old, religion has brought supernatural comforts valued by millions of souls as more precious than any natural aid. The natural inequality of men dooms many of us to poverty or defeat, some supernatural hope may be the sole alternative to despair. Morality should stand above power. More and more the (Catholic Church) hierarchy spent its energies in promotion orthodoxy rather than morality. Does history support a belief in God? The total evidence suggestions either a blind or an impartial fatality. Nature and history do not agree with our conceptions of good and bad; they define good as that which survives. One lesson of history is that religion has many lives. Normally and generally men are judged by their ability to produce — except in war, when they are ranked according to their ability to destroy. Since practical ability differs from person to person, the majority of such abilities, in nearly all societies, is gathered in a minority of men. The concentration of wealth is a natural result of this concentration of ability, and regularly recurs in history. The government of the United States, in 1933-1952 and 1960-65, followed Solon’s (Athenian statesman) peaceful methods, and accomplished a moderate and pacifying redistribution; perhaps someone had studied history. The upper classes in America cursed, compiled, and resumed the concentration of wealth. We conclude that the concentration of wealth is natural and inevitable, and is periodically alleviated by violent of peaceable partial redistribution. Businessmen left relatively free from transportation trolls and legislative regulation can give the public a greater abundance of food, home’s, comfort, and leisure than has ever come from industries managed by politicians, manned by governmental employees, and supposedly immune to the law of supply and demand. Competition compels the capitalist to exhausted labor, and his products to ever-rising excellence. Taxation rose to such heights that men lost incentive to work. What undermined the experiment? First, high taxes, laid upon all to finance a swelling band of governmental employees. Communism was a war economy. Given a generation of peace it would presumably be eroded by nature of man. The fear of capitalism has compelled socialism to widen freedom, and the fear of socialism has compelled capitalism to increased equality. The first condition of freedom is its limitation; make it absolute and it dies in chaos. The prime task of government is to establish order. If we were to judge forms of government from their prevalence and duration in history we should have to give the palm to monarchy; democracies, by contrast, have been hectic interludes. Most governments have been oligarchies. If the majority of abilities is contained in a minority of men, minority government is as inevitable as the concentration of wealth; the majority can do no more than periodically throw out one minority and set up another. As the sanity of the individual lies in the continuity of his memories, so the sanity of a group lies in the continuity of it’s traditions. Violent revolutions do not so much redistribute wealth as destroy it. The natural inequality of men soon re-creates an inequality of possessions and privileges, and raises to power a new minority with essentially the same instincts as in the old. The only real revolution is in the enlightenment of the mind and the improvement of character. In America democracy had a wider base. It began with the advantage of a British heritage: Anglo-Saxon law, which, from Magna Carta onward, had defended the citizens against the state; and Protestantism, which had opened the way to religious and mental liberty. The american Revolution was not only a revolt of colonials against a distant government; it was also an uprising of a native middle class against an imported aristocracy. Rural isolation enhanced the freedom of the individual, national isolation provided liberty and security within protective seas. Every advance in the complexity of the economy puts an added premium upon superior ability, and intensifies the concentration of wealth, responsibility, and political power. Democracy is the most difficult of all forms of government, since it requires the widest spread of intelligence, and we forget to make ourselves intelligent when we made ourselves sovereign. Lincoln supposed, “You can’t fool all the people all the time,” but you can fool enough of them to rule a large country. America in two centuries has provided abundance for an unprecedented large portion of its population. Though men cannot be equal, their access to education and opportunity can be made more nearly equal. In the last 3,421 years of recorded history only 268 have seen no war. The Ten Commandments must be silent when self-preservation is at stake. … should they consider also what future generations of Americans would wish that these leaders had done? Some conflicts are too fundamental to be resolved by negotiation. In organic periods men are busy building; in critical periods they are busy destroying. On one point all are agreed: civilizations begin, flourish, decline and disappear — or linger on as stagnant pools left by once life-giving streams. In any case a challenge successfully met, if it does not exhaust the victor, raises the temper and level of a nation, and makes it abler to meet further challenges. When the group or a civilization declines, is is through no mystic limitation of a corporate life, but through the failure of its political or intellectual leaders to meet the challenges of change. Taxes may mount to the point of discouraging capital investment and productive stimulus. The concentration of wealthy may disrupt the nation in class or race war. Death is natural, and if it comes in due time it is forgivable and useful, and the mature mind will take no offense from its coming. Our comforts and conveniences may have weakened our physical stamina and our moral fiber. We have multiplied a hundred times our ability to learn and report the events of the day and the planet, but at times we envy our ancestors, whose peace was only gently disturbed by the news of their village. We should not be greatly disturbed by the probability that our civilization will die like any other. The effort to meet the challenge of the rising East may reinvigorate the West. If education is the transmission of civilization, we are unquestionably progressing.